Of course, deer are not the only animals that could cause accidents. Depending on where you live, you may need to watch out for elk, moose, antelope, stray cattle, coyotes, wild pigs, and large birds. 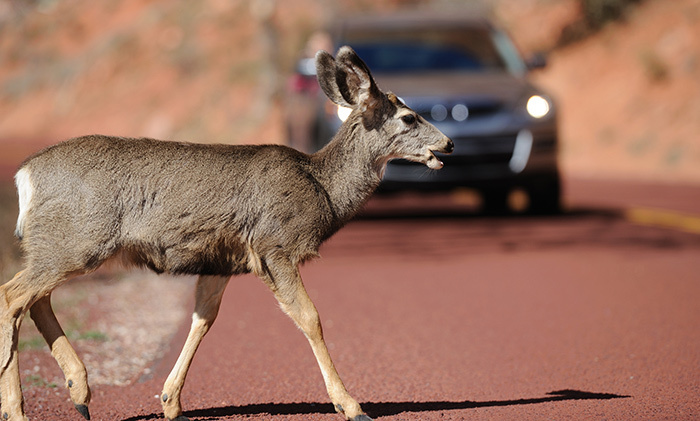 Given the potential risks associated with driving in the fall, you might consider these tips for avoiding a collision with deer or other large animals, and make sure you have appropriate insurance coverage in the event of an accident. See the signs. Traffic signs serve as a warning that deer, moose, and other animals frequent the area. Pay attention to the signs when you see them and consider reducing your speed. Be aware of animal behavior. Deer may appear near busy roads in cities and suburbs, not just in rural areas. These animals can be unpredictable and may suddenly dart into traffic if startled by lights, sounds, or unexpected movements. Deer travel in groups, so if you see one, watch closely for others that may be nearby. Use scare tactics. One long blast of your horn might scare animals off the road. If you are traveling at night, your high-beam lights could trigger animals to flee and help you spot animals in the road ahead. Know how to react. Your instinct might be to swerve out of the way if an animal appears in the road. Ignore the impulse; instead, slow down as much as possible and stay in your lane. This could help you avoid hitting another car or losing control of your vehicle. Don’t panic. If you do hit a deer or other animal, remain calm. Try to move to the side of the road and call the police. Do not approach the injured animal — it could act unpredictably. The collision portion of your auto insurance typically does not cover damage caused by animal strikes. You need comprehensive coverage to help pay for accidents of this nature. Comprehensive coverage also helps cover theft and damage to your own car resulting from fire, vandalism, falling or flying objects, explosions, earthquakes, and weather-related risks such as wind, hail, and flood. Some policies may also cover windshield damage. If you’re involved in a covered accident, you need to file a claim and pay the deductible. After that, your insurance company should pay your claim, up to the policy’s limits. Auto lenders may require that you have comprehensive coverage, but it is optional if you own your vehicle outright. Some policyholders choose to waive this coverage in order to reduce premiums. In most cases, though, premiums for comprehensive coverage are fairly low considering the variety of situations covered. Check with your insurance professional to make sure you have appropriate coverage for your situation.